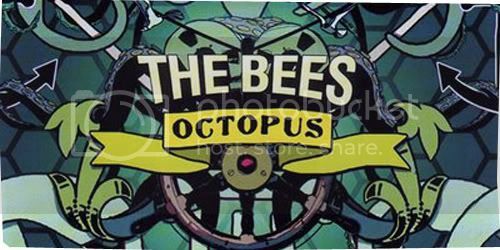 UK band the Bees, whom are known as A Band of Bees in the United States are an Indie rock sextet originally hailing from the Isle of Wight off the south coast of England. The music of the six piece are unparalleled to the Indie spectrum, for ably harking back to the cheery tunes of 60s and 70s psychedelic era, while producing a whimsical assortment of songs that could either be classified into the genre of country, reggae, jazz, or a mix of all elements together at once. ‘Listening Man’ is warm, tender balladry that contains a distinctive reggae inclination, a hugely addictive tune that’s decked out with effervescent percussions and sweeping horn destined to be mistaken with a retro piece that’s originally recorded during the Bob Marley period. With melodies that bounce along at a vivacious pace and a jovial atmosphere that’s sure to follow everywhere it goes, ‘Listening Man’ is one of the Bees’ tremendous works to be included in the critically acclaimed 2007’s Octopus. Interestingly enough, the video to the tune, takes on an unexpected theme; instead of following the predictable lane of using up old super 8 camera footages of the 70s still life, the video revolves around two characters, with a plot that faithfully stays true to the title. It’s bound to make you love the song even more, I’m sure of it.